Anna Greenberg is a dedicated personal injury attorney at Blizzard Law. Clients have come to know Ms. Greenberg for her passion for advocacy, attention to detail, and her tenacious pursuit of justice on behalf of her clients. Ms. Greenberg is a hands-on attorney who can provide the personal attention that other firms just don’t offer. At Blizzard Law, Ms. Greenberg works closely with clients to investigate and prepare their case for a successful trial. Ms. Greenberg specializes in mass tort pharmaceutical litigation and catastrophic injury claims. She has extensive experience preparing cases for trial, including drafting motions, deposing key witnesses, and arguing important legal issues before the court. Ms. Greenberg oversees nearly every aspect of a case—from its inception to verdict. Ms. Greenberg has litigation experience in a wide variety of practice areas. She was a valued member of the trial team seeking justice for young boys injured by Risperdal, a pharmaceutical drug manufactured by Janssen Pharmaceuticals, a subsidiary of Johnson & Johnson. 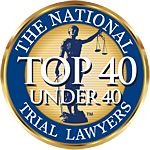 She has also worked extensively on truck accident cases, representing individuals who have been injured by truck drivers who feel asleep at the wheel or were using their cellphones while driving. Recently, Ms. Greenberg achieved a successful verdict in Arkansas federal court for a truck accident victim who was hit by a semi and suffered a traumatic brain injury. Ms. Greenberg’s current focus at Blizzard Law is to help individuals who have suffered a personal injury and those who have been injured by dangerous products, including pharmaceutical drugs and medical devices. She is currently working on the IVC Filter litigation, talcum powder litigation, motor vehicle accidents, sexual assault cases, and other types of personal injury claims. Ms. Greenberg works tirelessly to help her clients get on the road to recovery.